Whilst the Jewish Tribune and Jewish Chronicle have always been at daggers drawn on extreme oppposites of the community, the latter is also capable of binning letters that don't fit with its politics. Here is one regarding former Ladbroke chairman Cyril Stein's purchase of a house in Hebron which he handed over to the local Jewish community. Your editorial ‘The Wrong Address’ dismisses Cyril Stein’s purchase of a Hebron property as a ‘decidedly unhelpful … empty gesture’. However in your front page report the JNF takes the view that Stein’s major contribution to the building of the State should not disqualify him from doing what he feels is right. Stein made his fortune as a bookmaker. He is clearly betting that Jews have a more legitimate claim in a 4,000 year-old link to the city of their patriarchs than Palestinians who, most eminent historians acknowledge, were never heard of before 1948. In recent times Israel has given up land in Lebanon and Gaza to be ‘helpful’. Those gestures have been repaid with missiles. Perhaps Stein’s ‘decidedly unhelpful’ assertion of Jewish rights will get us something better. Belief in our own case. As the mouthpiece of the Union of Orthodox Hebrew Congregations, the Stamford Hill-based Jewish Tribune maintained a conspicuous and undignified silence throughout the Neturei Karta affair. It's rumoured that none of its writers are allowed to own a TV so perhaps they genuinely never saw those Chassidim kissing Mr Ahmadinejad in Teheran. More likely, the screed's rabbinical censors ordered them to ignore it. But last weekend -more than a year after I first exposed the scandal of Union funding to these kapos - the Tribune finally found its voice. But instead of finally condemning the mullah-huggers, they attacked me. Appended below is my response which, doubtless, the Tribune's censors will similarly order its hapless editorial staff to ignore.
" Sir: In ‘A Tale of Two News Stories’ Ben Yitzchok asks why I have not condemned the treachery of Teddy Kollek as forcefully as I have espoused condemnation of the Neturei Karta. The equivalence he seeks to draw reveals his basic misunderstanding of my position, which has never been political. Of course I utterly condemn Kollek’s sickening betrayal of Irgun fighters 60 years ago. It was a well kept secret that must have haunted him for decades. In stark contrast the ‘Rabbis’ of Neturei Karta make no secret of their treachery. They have embraced and kissed Ahmadinejad in the full glare of the world’s media and gone on to abuse the cherished memory of millions of Holocaust victims. Whilst Kollek is gone and likely facing din ve’cheshbon somewhere exceptionally hot, there is little doubt the NK must even now be planning their next Chillul Hashem Berabim. That is what needs to be roundly condemned by your paper. And it needs to be done in plain language rather than as a by-product of scoring cheap political points." I often think what might have happened if the Tribune and its rabbis had done the right thing a year ago. Had they uniformly condemned the activities of the Neturei Karta and cut them off from financial and other resources of the community, we might all have been spared the awful exhibition in Teheran. Instead they made it official policy to pretend the problem didn't exist. Someone needs to buy these rabbis a TV. We pass this 59th Yom Ha-Atzmaut in the wake of a frighteningly serious war and saddled with the most discredited, corrupt and inept government ever seen in the history of the State of Israel. In the 59 short years since the creation of the State we have seen miraculous development and growth in the country. In terms of population, infrastructure, science and technology, culture and of course its world-beating economy. Israel’s economy is bigger than all of her Arab neighbors combined, and notwithstanding her huge defense burden - triple that of the USA and five times that of the UK as a percentage of GDP. But for all this exponential growth in every conceivable area that we happily record on this 59th Independence Day, there is one vital feature of statehood that has failed to make the grade and has eroded significantly in real terms. Israel is now more dependent on others than perhaps it has ever been before. Dependent on the USA for its defense and economic aid, dependent on the EU for its trade, dependent on the UN for the few crumbs of legitimacy it ever receives and dependent on the world’s left-leaning media for the few breaks it ever gets in balanced reporting. Moreover it is dependent on a handful of lone voices in academia to loyally argue its case and thereby stave off resolutions of boycott and divestment. It is hard to see Israel ever becoming truly independent until it has the self-sufficiency to spit the world in the eye as the oil-rich pariah states do so well. Until that time, Israel will have to continue to kowtow to world leaders whose foreign policy is based on appeasement, self interest and fear of terrorism being brought onto their streets. Israel will continue to subordinate its security decisions to the political whims of successive American secretaries of state on their whirlwind visits to the region, tearing down vital security checkpoints to prop-up so-called moderates in the enemy camp for another month or until the next congressional election. Israel has therefore been celebrating an illusion for 59 years. But whilst true independence continues to elude the State, the Jewish people have never really lost it. Our people achieved their independence at Mt. Sinai. That was the time and place where they were chosen by the Almighty in preference to all the other nations on the planet. Chosen to be different, to hold to a higher set of morals and standards. Chosen to be the people of the book – the nation of Torah. And this independence – ‘la différence’ - is what has singled out the Jews in every generation for envy and hatred by virtually every country and creed you could care to name. Traditionally the greatest hate had been reserved for the more religious who wore strange hats and clothing – those who so blatantly failed to assimilate in the ways and appearance of their host countries. A people apart. They who clung jealously to their traditions of Sabbath observance and observance of torah and mitzvot. Those Jews who have assimilated, have lost their identity as Jews and – in the process – have lost that spiritual independence among nations that was gifted at Sinai. If they look, act, eat and behave like gentiles – what will ever make them special other than the purely material standards of wealth and power? What is there left to fight for … or to hand over to the next generation? Such is the unfortunate predicament of the State of Israel. Its secular leaders crave assimilation amongst the nations of the world. For people like Shimon Peres and Avigdor Lieberman – two coalition members at extreme opposites of the political divide – their most prized ambition is for Israel to become a member of the European Union. In Jewish terms this would be a disaster! Peres and Lieberman are savvy enough to know that – for all the extra trade and development grants that would spring from EU membership – there is an awful sting in the tail. The free movement of labor. That, in effect, Israel would no longer be in control of her borders and would be unable to decide who comes to live and work in the country. On an individual scale, Jews who assimilated have given up the Torah and their special lineage. Similarly on the national scale, if Israel assimilates into the EU, it will forfeit its position as a Jewish state. Like the ordinary Jew clinging to his traditions, Israel’s independence can only be assured if it strives to maintain its position as a Jewish State – not just as a ‘State for the Jews’. This means stubbornly clinging to the land which is ours and our articles of faith. This is why I personally don’t make much ado of Yom Ha-Atzmaut. For me, Yom Yerushalayim has by far the greater significance. Those that cleave to Jerusalem. And those that yearn for Brussels. The heroism of Israeli Professor Liviu Libresco in placing himself in the line of fire to protect his students at Virginia Tech reminded me of another younger hero in similar circumstances. On Friday night, December 27, 2002 over a hundred Israeli teenagers and young adults sat down for the Sabbath meal at the yeshiva of Otniel in Judea. Four of the students whose turn it was to be the evening's "waiters" went to serve the main course in the kitchen adjoining the dining room. 23 year old Noam Apter was among them. Suddenly two terrorists dressed in Israeli army uniforms burst into the kitchen and sprayed the four waiters with fire from their M16's. Hit by the bullets and mortally wounded, Noam used his last strength to run to the door connecting the kitchen and the dining room. He closed it, locked it, and threw the key into a corner. He then collapsed and died, lying against the door. The terrorists tried to open the door. Seeing it locked, they sprayed gunfire through a small glass window into the dining room. After realizing that this fire was inaccurate and wild (it wounded six more students) and having already killed the four student waiters, the terrorists fled the kitchen, later to be hunted down and killed by the Israeli army. And whilst on the subject of Gilad Shalit, just consider this. 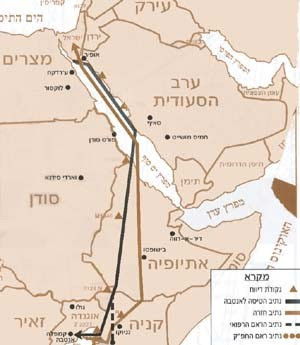 3o years ago Israeli troops flew 2,200 miles to a foreign country and rescued 80 Jewish civilians in Entebbe within a few days of their capture in an airplane hijacking. Today - after 9 months - the government of Israel has not been able to organise the rescue of a single lonely soldier from our own back yard! In Gaza ... an area the IDF has occupied for decades and knows like the back if its hand. Is it any wonder that our enemies no longer fear us? That they laugh at us? That they can only be encouraged to do more of the same? The prisoner exchange for Gilad Schalit is on-off, on-off. One has to suspect that Olmert is carefully planning the timing of any exchange to coincide with the publication of any damning conclusions by the Winograd commission. As the politicians say: ‘a good day to bury bad news’. The idea of releasing 1,000 terrorists is utterly reprehensible. Unless of course you happen to be the parent of the kidnapped soldier. And none of us can imagine what it must be like in that position. But just think of it. Israel extensively trains and sends soldiers like Gilad Schalit into battle to defend the citizens of Israel. 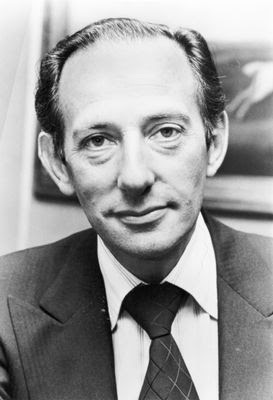 Whilst it is by no means certain that Schalit would have saved a single Jewish life in his whole term of army service, it is an absolute certainty that his exchange for 1,000 terrorists will result in at least one recidivist terror attack on some bus, restaurant or other soft target in Israel within the next 12 months. Most likely a lot more. This is based on research by the terror victims association Almagor that 30 recent terror incidents were perpetrated or planned by prisoners earlier released by Israel. And even if we are lucky enough to suffer no recidivist killings by those who are released, at the very least, such one-sided exchanges are bound to embolden new terror recruits to more audacious attacks knowing that, if caught, they will never serve a full term of imprisonment and may even enjoy the liberal privileges of Marwan Barghouti who is having a whale of a time in jail. All of which leads to the inescapable conclusion that, in the context of such a prisoner exchange, Gilad Schalit becomes the exact opposite of a soldier in the Israeli army. Instead of defending the citizens of Israel, his release by such an irrational exchange actually imperils our people. Imagine an IDF soldier turning his gun on his own people! Compare this with the heroism of Golani trooper Roi Klein who threw himself on a grenade to save members of his unit from certain death. Olmert does not have the right to create an anti-soldier. And Gilad does not deserve to be discredited in that way. Nor to have on his conscience the next batch of recidivist terror victims. 1. Open a new file or folder in your computer. 2. Name it "Ehud Olmert"
5. Your computer will ask you, "Do you really want to get rid of "Ehud Olmert?" PS: Next week, we'll do Shimon Peres. After that, Amir Peretz. Boundless joy. Today is Yom Hashoah – Holocaust Remembrance Day in Israel. Shops are closed, radio and TV stations muted. At least in some small part of the world there is more than lip service to the torture and ultimate destruction of 6,000,000 souls. My father was one of the fortunate survivors. However, until his death at the age of 41 - from heart disease contracted in Auschwitz - he used every day of his subsequent freedom to ‘tell the story’. To ensure that future generations would know what happened. How inmates of the death camps risked their lives to bake matzah for Pesach and find oil for Chanukah lighting. If he were living today, I am sure he would be warning all of us not to let history repeat itself. 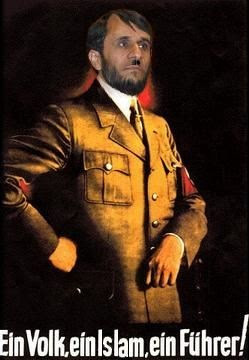 Adolf Hitler set out his clear plans to wipe out the Jews and subjugate the world to his will in Mein Kampf. Few took him seriously. Jews ignored the threat and world leaders like Neville Chamberlain described Herr Hitler as ‘an honourable man’. Ahmad Ahmadinejad has done exactly the same. He says what he means to do and he means to do what he says. And he aims to do so with the help of weapons that will defy even the most powerful coalition when they finally wake up and get mobilised. The message of Yom Hashoah and all the holocaust memorials around the world is no longer ‘Never Again’. The UK's National Union of Journalists have been bashing Israel again at their annual conference. During what must have been the lunch break (or a fire drill) there was a 66-54 vote denouncing Israel for its military adventurism in Lebanon and calling for a boycott of Israeli goods on the same basis (and presumably with the same justification) as was used against the apartheid regime in South Africa. As you may have noticed from my blogs, I have a fascination with timing and the coincidence of events as reported from week to week. 1) Whenever the spectre of apartheid is raised in condemnation of Israel, I always remark that I cannot remember a single black man ever serving in the Verwoerd government. Curious therefore that in the same week as this loony vote brands Israel as an apartheid state, the lead story in Israel is about an Arab member of the Israeli parliament who has gone AWOL. 2) Also this week we have seen demonstrations by journalists in Gaza calling for the release of BBC correspondent Alan Johnstone, kidnapped by Arab gunmen a month ago. Perhaps those journalists might reflect that the reason why their dear colleague was kidnapped is because Gaza is a lawless territory of warring gangs. It is so because terrorism has been rewarded with cash from the EU and cajolement from those same journalists, including Johnstone, who play by the PA rules of reporting. That is to say: if you want access to stories and safe passage in Gaza, make sure your postings are sympathetic to our cause. The National Union of Journalists' vote may well have been directed at appeasing the terrorists and getting Johnstone released. But in the long run it will only endanger others in their profession. Footnote: Now that I think of it, where were the journalists and their demonstrations after the kidnap and execution of Daniel Pearl? At a conference entitled "The Sea as an Economic Resource," Shimon Peres says Israel should stop investing in Judea and Samaria and build artificial islands in the Mediterranean instead. So now we don’t need to worry about the Arabs pushing us into the sea. We’ll do it all by ourselves! Sometimes the more you look into something, the worse it gets! A few days ago I blogged a piece about George Soros's childhood in Nazi-occupied Hungary and how he confessed no guilty feelings over his family's assistance to the Nazi looting of property belonging to Jews who had been sent to the gas chambers. Turns out that this man thinks he is God! "I have always harboured an exaggerated view of my self-importance – to put it bluntly, I fancied myself as some kind of god..."
Would it surprise you to know that this man funds a string of political action groups through which it is claimed he has bought and paid for the Democratic Party? That he is the man pulling the strings of Hillary Clinton's candidacy for the Presidency? That he is behind the bid to impeach George Bush? That he has been investing the fortune he made in America in a bid to undermine its war in Iraq and ultimately end its leadership of the free world? Sounds like the ultimate conspiracy theory, no? But you need to read this interview with the writer who has exposed this alarming situation. I am half-way through it and it's truly very scary. By Thursday night we were all bewailing the resolution of the latest Iran hostage crisis and the way in which Ahmadinejad was left smelling of roses with his wonderful Easter Gift in the release of the 15 sailors to a humiliated British government. In ordinary circumstances one would have expected the likes of the Guardian and Independent newspapers to laud this tyrant’s manganimity and - in echoes of the Baker/Hamilton Iraq Study Group – make some daft suggestions that it is ‘time to engage with our friends in Iran, as jaw-jaw is better than war-war’. Fortunately, even in this arid region, the ink does not dry quickly enough. By Friday morning the UK headlines were filled with outrage against Iran’s sponsorship of terror bombings in Iraq which claimed the lives of four UK troops, two of them women. Locals were shown rejoicing with the macabre debris of the blast. ‘Iran’s Real Easter Gift’ was the Friday headline in the Daily Mail. Fortunately Israel has always been able to depend on two lifesavers. One is divine intervention and the other is the foolishness of its enemies. Isaiah foretold that our enemies and haters would come forth from our own people. This is of course the most effective form of treachery since such people can always claim to have knowledge of our deepest motivations and our best interests at heart. Such a man is George Soros the ‘Hungarian Jew’ most famous for breaking the Bank of England during the sterling crisis in 1992 and pocketing a profit of $1 billion. Soros thinks he can fix everything that’s wrong in the world and also solve the problems of ‘his own people’ in ‘Palestine’. Soros claims to genuinely care about his people. But do not be fooled. He only looks after himself. And rather well.